Description: Maj. Gen. Sterling Price’s Missouri Expedition had changed course from St. Louis and Jefferson City to Kansas City and Fort Leavenworth. As his army neared Kansas City, Maj. Gen. Samuel R. Curtis’s Army of the Border blocked its way west, while Maj. Gen. Alfred Pleasonton’s provisional cavalry division was closing on their rear. Price decided that he needed to deal with the two Union forces and decided to attack them one at a time. With Pleasonton still behind him, Price chose to strike Curtis at Westport first. Curtis had established strong defensive lines and during a four-hour battle, the Confederates hurled themselves at the Union forces but to no avail. The Rebels could not break the Union lines and retreated south. 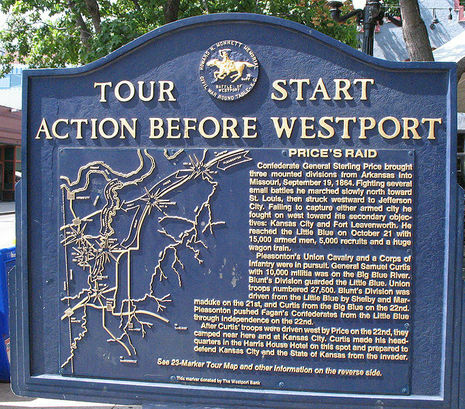 Westport was the decisive battle of Price’s Missouri Expedition, and from this point on, the Rebels were in retreat. The Battle of Westport, sometimes referred to as the "Gettysburg of the West," was fought on October 23, 1864, in modern Kansas City, Missouri, during the American Civil War. Union forces under Major General Samuel R. Curtis decisively defeated an outnumbered Confederate force under Major General Sterling Price. This engagement was the turning point of Price's Missouri Expedition, forcing his army to retreat and ending the last significant Confederate operation west of the Mississippi River. This battle was one of the largest to be fought west of the Mississippi River, with over 30,000 men engaged on both sides. Westport (now a part of Kansas City, Missouri) had already established its place in history by the time Union and Confederate forces clashed there in 1864. John Calvin McCoy, known as the "Father of Kansas City", had laid out the town, and pioneers traveling along the Oregon, California and Santa Fe Trails had all passed through this town on their way West. Westport Landing gradually replaced nearby Independence as the "jumping-off point" for the Westward trails, contributing to the growth of the town. During the Civil War, nearby Kansas City (known then as the City of Kansas) served as headquarters for the Federal "District of the Border" and was garrisoned by a sizable contingent of Union troops. While its own municipal star was beginning to fade in favor of its northern neighbor, Westport was still of some importance in the region. As it turned out, however, the decision to fight here would be the result of a chain of events that had little to do with any strategic importance attached to the town itself. In September of 1864, Sterling Price led his Army of Missouri into Missouri, with the hope of capturing the state for the South and turning the Northern people against Abraham Lincoln in the presidential election of 1864. Major General William S. Rosecrans, commanding the Federal Department of the Missouri, began assembling troops to repel the invasion. Rosecrans's cavalry, under Major General Alfred Pleasonton, set out in pursuit of Price's force accompanied by a large detachment of infantry from the Army of the Tennessee under Andrew J. Smith. Finding St. Louis far too heavily fortified for his rather small force (12,000 men), Price moved west to threaten Jefferson City. After light skirmishing, Price again decided that this target was also too heavily fortified and moved further west towards Fort Leavenworth. As he marched on, disease and desertion coupled with battlefield losses to whittle Price's force down to 8,500 men. Major General Samuel R. Curtis, commander of the Federal Department of Kansas, now faced the threat of Price's army moving into his department after learning of Confederate movements from spies including Wild Bill Hickock. Curtis accordingly assembled his troops into a force that he named the Army of the Border. James G. Blunt was recalled from Indian campaigns to lead its 1st Division, composed mostly of volunteer regiments and some Kansas militia. Curtis was only initially able to muster about 4,000 volunteers; he asked Kansas governor Thomas Carney to call out the state militia to bolster his forces. Governor Carney immediately suspected Curtis of attempting to draw the militia away from their voting districts, as election time was nearing. Carney was unconcerned with Price's force far away in Missouri, and felt it posed no threat to Kansas. However, once Price had turned west toward Jefferson City, Carney relented and Maj. Gen. George Dietzler took command of a division of Kansas Militia that now joined Curtis' Army of the Border. By order of Maj. Gen. Blunt (General Field Orders No. 2) the militia regiments of W.H.M. Fishbeck, Brigadier General of Militia, were placed under the command of Charles W. Blair, Colonel of Volunteers; Fishbeck was infuriated that his command had been subordinated to a volunteer officer. Because Kansas law stated that militia should be kept under the command of militia officers, Fishbeck disregarded Blunt's order. Blunt had Fishbeck arrested and held until released by order of Maj. Gen. Curtis. Upon his release, Fishbeck resumed command of the 5th, 6th and 10th Kansas Militia regiments, with orders to obey directives that came from Maj. Gen. Blunt. This rather cumbersome arrangement had Brig. Gen. Fishbeck in direct command of the militia units attached to the 3rd Brigade, 1st Division, and Col. Charles Blair in overall command of the brigade. Howard N. Monnett describes the arrangement as a "brigade within a brigade". Blair and Fishbeck would lead the militia into action at Westport (accompanied onto the field by General G.W. Dietzler), and then in the subsequent pursuit of Price until Maj. Gen. Curtis finally ordered the militia to return home. General Curtis sent the bulk of his 1st Division under Gen. James Blunt to confront the Confederates at Lexington, approximately forty miles east of Kansas City, on October 19. Blunt was unable to stop Price, but did slow his progress and gathered information on the Confederate forces. Again, at the Little Blue River on October 21, Blunt was forced to retire–but not without slowing Price enough for a pursuing Federal cavalry division under Alfred Pleasonton to close the gap between himself and the Rebels. Additional fighting occurred the next day at Independence, with Price emerging victorious yet again. Curtis was nearly sixty years old, and age had taken a toll on his desire for combat; however, thanks to his aggressive subordinate Gen. Blunt, Curtis decided to make another stand south of Westport. Blunt personally oversaw the construction of a defensive line south of the town along Brush Creek, perpendicular to the Kansas state line. Price was aware of the forces to his front and rear, which together outnumbered him nearly three-to-one, so he determined to deal with them one at a time. He decided to attack Curtis' army first, at Westport. Almost as old as his adversary, Price left direction of the engagement to his subordinate, General Jo Shelby. With about 500 wagons and 5,000 head of cattle, Price first needed a ford for his supply trains to cross the Blue River near Westport. One of Price's divisions under John S. Marmaduke accordingly forced a crossing at Byram's Ford on the 22nd, then took up positions on the west bank to hold off Pleasonton's Federal Cavalry, which now threatened Price's rear. Two other two Confederate divisions, under Shelby and James Fagan, were poised to assault Blunt along Brush Creek the next day, hoping to defeat him before Pleasanton could arrive on the field in force. Anticipating Price's impending attack, Blunt had positioned three brigades along Brush Creek, while a fourth under Col. Charles Blair was en route from Kansas City. From right to left were brigades under Colonels Thomas Moonlight, Charles "Doc" Jennison, and J. Hobart Ford. At daybreak on the 23rd, Ford and Jennison opened the Battle of Westport by crossing Brush Creek with skirmishers and engaging Shelby's troopers in an open field beyond. The Confederates counterattacked, driving the outflanked Federals back across the creek. Moonlight's brigade was hit so hard that it was forced to retreat across the Kansas state line, while Jennison's brigade retreated almost into the streets of Westport. It appeared at this point that the Confederates might carry the day. But this was not to be. At this crucial hour, Col. Blair's fresh brigade arrived on the scene; Curtis also heard Pleasonton's guns engaging the Confederates at nearby Byram's Ford. His spirits lifted, Curtis rode to the front lines to personally direct Blair's troops into battle. The reinforced Federals charged once more across the creek, but were again repulsed and retreated to the north bank. Needing another option besides frontal assaults, Curtis decided to search for a weak point elsewhere in the Rebel lines. Coming across a farmer searching for his lost horse, Curtis was shown a gulch running up to a rise along Shelby's left flank. Thomas Moonlight's brigade, still across the Kansas border, was in prime position to exploit this opportunity. Moonlight's 11th Kansas Cavalry escorted a Wisconsin Battery through the gulch and hit Shelby's left brigade, under M. Jeff Thompson, from the side. While Moonlight was hitting the Rebel flank, Blunt renewed his attack along the front with Jennison's and Ford's brigades. The weight of this new attack and the surprise of Moonlight's flanking maneuver proved too much for the Rebels, who were forced back across the prairie to higher ground. Here they unleashed several unsuccessful counterattacks against Blunt's steadily-advancing forces. With this reverse and the defeat simultaneously suffered by Marmaduke at nearby Byram's Ford, the Confederates' fate at Westport was sealed. As disaster was befalling Shelby and Fagan, a similar fate was happening to Price's rearguard, under Marmaduke, at Byram's Ford. A division of Price's army under General Shelby had forced a crossing at the ford on the 22nd (the day prior to the battle), forcing Federal defenders there to retire to Westport. Shelby's colleague General Marmaduke had subsequently established his own defensive line on the west bank of the river to hold off Pleasanton's cavalry, which was pressing them hard from the east. If Pleasanton could now force his way across the Blue River, he would be in position to threaten Price's army as well as his supplies. Marmaduke's division was attacked by three of Pleasonton's brigades starting at 8:00 on the morning of the 23rd; the Confederates initially managed to hold their own. One of the Union brigade commanders, Brig. Gen. Egbert B. Brown stalled his attack and was placed under arrest by Pleasonton for disobeying orders. Another of Pleasonton's brigade commanders, Col. Edward F. Winslow, was wounded and succeeded by Lt. Col. Frederick Benteen, who would later ride to fame at Little Bighorn. Despite these setbacks, Federal troopers gained the west bank by 11:00 and Marmaduke retired. As Brown's brigade (now led by Col. John F. Philips) forded the river, they came under heavy fire from Marmaduke's artillery. Once they had crossed, they charged Marmaduke across an open field; during this charge, Union troops from Missouri and Arkansas battled Confederates from these two states. Marmaduke was forced back, rejoining Shelby and Fagan, and Blunt pounded the now-consolidated Confederate remnants with his own cannon. While the main Confederate army was now being hit hard on two sides, Pleasonton's fourth brigade under Brig. Gen. John McNeil moved against a Rebel brigade under William Lewis Cabell guarding a second ford near Hickman Mills. McNeil's brigade was able to drive the Confederates from the ford and cross the river. Federal columns were now converging on Price from three different directions. The Confederates pulled back to their last line of defense, along the road to the town of Little Santa Fe, establishing their lines on Forest Hill. Intending to retreat south through Kansas toward Arkansas, Price's men set fire to prairie grass in the area to create a smoke screen to cover their withdrawal. Witnesses reported that the road was strewn with debris from the fleeing Rebel army. The following day, Blunt and Pleasonton took up their pursuit of Price's remaining forces. They would chase Price through Kansas and southern Missouri into Arkansas, engaging him at the Marais des Cygnes, Mine Creek, the Marmiton River, and finally at Newtonia, ultimately leaving the Confederate leader with less than 6,000 survivors from his initial force of 12,000 when his campaign officially ended on November 1, 1864. The Battle of Westport was one of the largest battles west of the Mississippi River, with over 30,000 troops involved and roughly 1,500 casualties on each side. The Union victory put an end to Price's campaign for Missouri, and the battle has accordingly been referred to as "The Gettysburg of the West". This greatly-contested border state of was now firmly under Union control, and would remain so until the end of the war. Although never capturing Price or the tattered remnants of his army, Federal forces did manage to render the Army of Missouri incapable of any future significant operations. Indeed, Price's campaign would prove the last in the Trans-Mississippi Theater, and the last major Confederate threat to any northern state. Several participants in the battle later went on gain national fame in other ways, many of them in the American Old West. Buffalo Bill Cody served as a private in the 7th Kansas Cavalry ("Jennison's Jayhawkers). Wild Bill Hickock served as scout for General Curtis. Frederick Benteen, who assumed command of a brigade at Byram's Ford, would subsquently fight with George Custer at the Battle of Little Bighorn. Senator Jim Lane and Kansas Governor Samuel J. Crawford served on Curtis' staff. 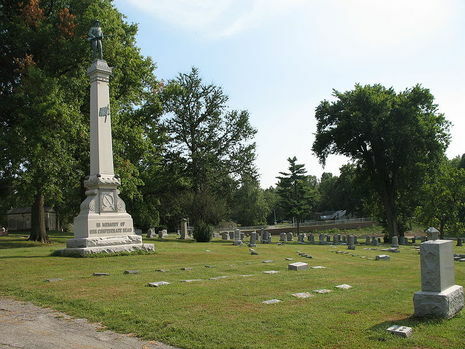 Thomas Theodore Crittenden, served in the Kansas Militia Cavalry forces and was later buried in Forest Hill Cemetery, the scene of fighting during Price's retreat from Westport. Mountain man John "Liver Eating" Johnson (popularly known as Jeremiah Johnson) enlisted in the U.S. Navy before the war and on February 24, 1864 joined Company A, 3rd Regiment, Colorado Cavalry Volunteers "from depot in St. Louis." With that regiment, he fought for the Union at the Battle of Westport. Johnny Ringo fought under Shelby on the Confederate side. Thomas C. Reynolds joined Gen. Price's staff, in hopes that Price's army might capture Jefferson City and install him as governor of a Confederate regime in Missouri. Although many signs and placards commemorating some aspect of the Battle of Westport are present throughout Kansas City today, the main battle monument is located in the Sunset Hill neighborhood just south of the Country Club Plaza. Because the center of the main battlefield comprises present-day Loose Park and a portion of the lower (Wornall) campus of The Pembroke Hill School, the memorial is at the southern end of Loose Park, along West 55th Street. A Battle of Westport Driving Tour starts in Westport at Kelly's Westport Inn, the oldest standing building in Kansas City, Missouri. It consists of a series of placards, one at each stop, giving both a detailed history of what occurred there and directions to the next stop. Stops along the self-guided tour include the Wornall House, which served as a hospital during the battle, and Forest Hill Cemetery, the final resting place of many men and officers of General Joseph Shelby's "Iron Brigade". The first steps toward memorializing the Battle of Westport came early in the twentieth century. In 1906, local historian Paul Jenkins published his Battle of Westport, while the Byram's Ford engagement was reenacted in Swope Park in 1912. During the 1920's, civic leaders under H. H. Crittenden of the Missouri Valley Historical Society conceived a plan to save the Westport battle sites near present-day Loose Park and Byram's Ford. Crittenden's father was Col. Thomas Crittenden, who led one of the Union cavalry brigades at the Byram's Ford battle, and later served as governor of Missouri. The mayor and council of Kansas City passed ordinances recognizing these sites; this was followed by the introduction of a bill in 1924 in the United States Congress to create a National Military Park. This endeavor proved unsuccessful, and memorial efforts ceased for several years. During the 1950's, much of the battlefield was disturbed by commercial and industrial construction, though the developer of one industrial complex did erect a memorial near the historic route of the Byram’s Ford Road. On the eve of the Civil War centennial in 1958, the Civil War Round Table of Kansas City was formed with former President Harry S. Truman as a charter member. Dr. Howard N. Monnett, a member of this Round Table, researched, spoke and wrote extensively about what he termed the "action before Westport". His book of that title was published in 1964 for the battle's centennial. Dr. Monnett’s enthusiasm led to the eventual creation of an automobile tour of the widely-dispersed battle sites. By 1979, the founders of the Monnett Fund had successfully raised funds to erect permanent markers at 25 sites, and had created a self-guided automobile tour. These markers included a monument located at the meadow site, and several wayside markers on nearby Bloody Hill. The battlefield was entered on the National Register of Historic Places in 1989, after the Fund acquired 50 acres (200,000 m2) of the Westport battlefield, including the site of Byram's Ford itself. Title was transferred to the Kansas City Parks Department in April of 1995, and archaeological surveys in 1996 revealed artifacts from the battle in and around the Byram's Ford area.